Is that joke in poor taste? My dad's Catholic (or "ex-Catholic," rather), so I suppose I should be a little more reverent. Here I am at JP2's tomb. I liked him, so that's a genuine pouty lip. Anyway, this is one of my favorite Elvis songs. I remember sitting next to him eating dinner in the green room, when he was typing up a setlist, and asked what he should play. (Seriously, that happened.) I suggested "Red Shoes," and he added it to the list, which I now have framed in my living room. We all know now that the Pope wears Prada red shoes. To be fair, maybe he was just buying local. Lately, I've been really wanting to be in a musical. I used to do theater. In fact I did a lot when I was a kid. Sometime in high school, I suffered a self-confidence blow when it came to singing (I never had as good a voice as the other people in my choir), and I was relegated to the orchestra pit for the musicals. In fact, I pretty much was the orchestra pit, playing the majority of the score on a fancy Kurzweil. Clearly, I'm over that now, though I do still adore playing my Kurzweil. Every night at the wee boy's bathtime, I sing most of the score from The Sound of Music and fantasize about dancing around on stage with seven little Von Trapp children. (Note that my fantasies are about seven children ON STAGE, not in reality.) I've thought about auditioning for some of the local theater stuff, but this little boy's just taken all of my attention. Needy baby!! I'm still a bit off-balance. It's hormones, sure, but it's also me trying to deal with not having alone time. I am re-energized when I get some time to myself, even if it's just 10 minutes to walk around the block. This silly baby is not cool with me even leaving the room, so I've been busy mood swingin' and going crazy. You know what? I forgot what I like to do. If I were in Edinburgh, I would have walked to the castle. I would have popped into a free museum. I would have strolled through Princes Street Gardens or watched the swans in Inverleith Park. I love Louisville dearly, but there is very little to do when you have no expendable income and no car. I walked up to Heine Brothers and sat outside on a bench (even though it was way cold yesterday -- yes, colder than it ever is in Scotland) and wrote "I think I'm going crazy" a hundred times in my journal. That is a slight exaggeration, but it's what I felt like writing. I'm pretty sure, instead, that I wrote a To Do List of all the things I should have been doing rather than writing in my journal. Prove me wrong. What can you do on a cold day in Louisville with no money and no car? Sorry for the lame blog. I'm about to get serious with those NHS blogs. I have loads to say about the birth and the postnatal care. Don't worry; it's nothing graphic. Having a Baby Abroad (7). NHS. Midwives. Birth choices. Now that I've finally been feeling mildly social, I've talked with many of you about my blog. Apparently the most interesting posts were not about music tours or backstage with Elvis Costello ... they are about my experience as an American living and using the National Health Services of Scotland. I've had loads of blogs in draft about it, but haven't managed to get away from the baby long enough to make sense of them. Here is my most recent attempt. A quick refresher: Maternity Care in the UK is led by midwives. If a midwife decides a patient is high risk, she is referred to an obstetrician and is supposed to give birth in a hospital. All other women (the majority) have the option of a home birth, a birthing centre, or a hospital. My last NHS Maternity Care post was written six days before the baby was born. Here's the link, if you'd like to catch up. It was a basic overview of all of the prenatal appointments I had, and about receiving the good news from my obstetrician that I was not, in fact, high risk, as suggested by my mother's history. If you had asked me before I was pregnant what kind of birth I was interested in, I would have told you I wanted to be completely knocked out -- 1950s style -- and feel nothing and remember nothing. Modern medicine is an improvement, right? Women no longer have to feel that whole pain of childbirth thing. wondered how I could balance #3 & #4 with a having a standard hospital birth. The whole "standard hospital birth" was, of course, the American in me. The British system, being midwife led, does not automatically assume you want an epidural (though they offer them to anyone who wants one and who qualifies medically). Oddly (to me anyway), the midwives seemed to assume I would want to use the new Lothian Birthing Centre -- a spa-like facility connected to the Edinburgh Royal Infirmary that opened in October of 2011. I was still confused. If you research something long enough, you eventually come to your own conclusion. Mine was that there was no way in hell I wanted any sort of unnecessary medical intervention. Part Two: Registration, Doctors, Midwives, etc. Part Three: NHS, midwives, home births. Part Four: Waiting Lists, Emergency Room Visits. Part Five: High Risk Obstetricians and Hospitals. Guess what I DIDN'T do last night? Also, Downton Abbey. one week old -- not last night. Sigh. So much for sleep! I got a good five and a half hours on Sunday night. 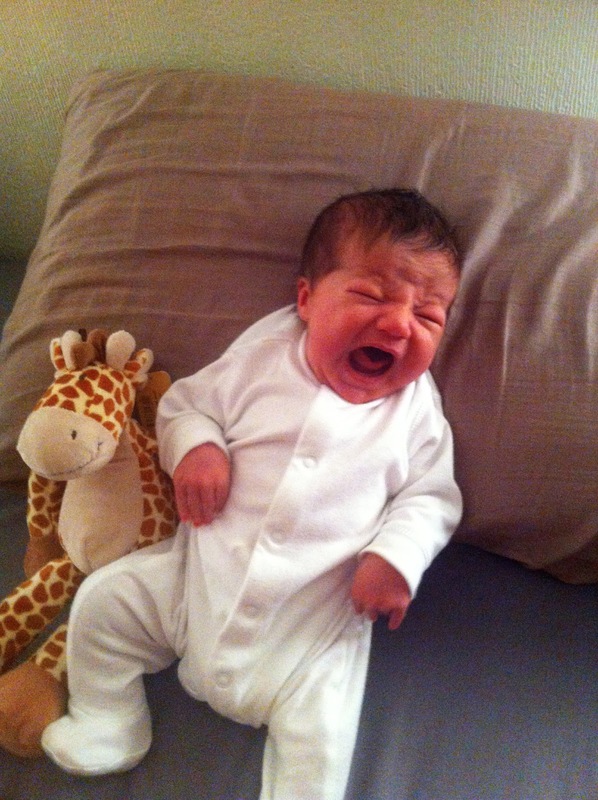 Last night, however, was a screamfest at Chez Caldwell/Kaelin. Baby for sale! Being awake in the middle of the night was more fun when I was living in Scotland. When I was on GMT, I could browse Twitter and Facebook and see all the crazy antics my friends back home were getting into. Eleven pm on the Louisville twitter feed is really fun, but four am is really dull. Instead, David and I browsed Closet boards on Pinterest. Rock star life, right? Speaking of things that happened sooner in Scotland ... Downton Abbey! You've all seen the finale by now, right? Don't worry, I'm not going to write a spoiler. I think my Mom still doesn't understand Twitter, though, so for her sake (and yours, of course) I restrained myself. Also, I forgive you all for ruining the State of the Union and the Superbowl for me with your spoiler tweets. Just nobody tell me who shot JR, okay? Guess what I did from 10p-4a last night? SLEEP!!!! Hallelujah. This nursing thing is hard on the sleep cycle. (UK friends, most Americans seem to say "nursing" rather than "breastfeeding," at least in these parts. I think that's because saying the word "breast" still makes most of us giggle.) I'm thankful that nursing is going well, but I'm admit I'm a wee jealous of my formula-using friends whose babies have been sleeping for months. Sometimes I feel like feeding the boy is the only thing I'm good at when it comes to this whole "parenting" thing, though, so I'm going to stick with it as long as I can handle. Sleep is grand. I feel lucid. I feel like talking to the grumpy neighbors. I feel like baking a pie and meeting the new neighbors. I feel like ... checking my email. This is big, folks. Really big. Mardi Gras fun in Louisville! It's Mardi Gras! That doesn't mean much in Louisville, of course, but we do still like any good excuse for a party. I'm booked tonight (along with every other accordion player in town, I suspect) playing a private event, but there are plenty of other good Mardi Gras parties going on in town. 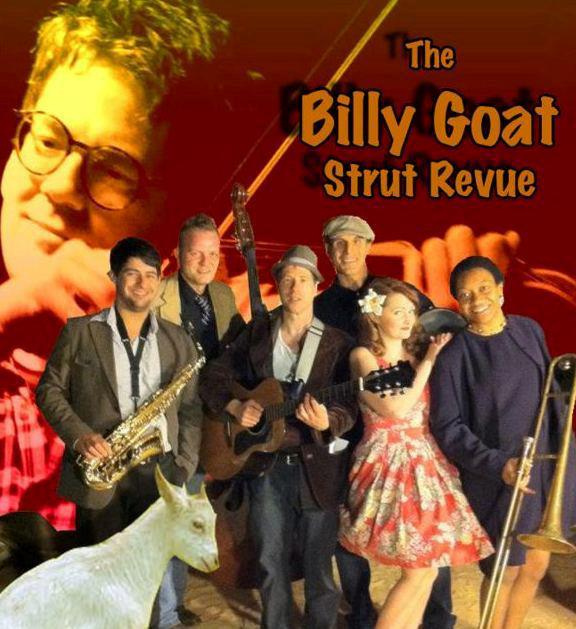 If I weren't booked already, I'd be heading out to Uncle Slayton's for the Billy Goat Strut Revue's show tonight. If you haven't heard the Billy Goat Strut Revue, well, first ... think again because you MAY have heard them at my farewell show right before I headed off to Scotland. You see, they were the opening band, and I used to sing with them! It's one of many jobs I was bummed to give up when I moved abroad. I can tell you now, however, that there is not a more perfect frontwoman in this town for BGSR than Laura Ellis, aka @funambulator, whose song "Inertia" (from her days in Shine-Ola) has been stuck in my head for approximately eleven years. Laura's voice has long been a favorite of mine, and she is certainly a better dresser than I am. She's also wicked smart and always makes me smile. Anyway, if you're looking for fun and sweet New Orleans music tonight, head down to Uncle Slayton's. Here's the Facebook event. a lucky $7 @ the door gets you in, be on the lookout for King Cake, happy beads, a drink special or 2, and a surprise or 10 thrown in just cuz. doors open at 8 and the show cranks up at 8:30 so no messin' around - get there! Hibernation, babies, just checking in. So you haven't seen my wee boy yet? Guess what? Neither has most of my family. We are sorry. We've been hibernating, albeit not really on purpose. David is madly hunting for a full-time MBA-type job (know anyone? want to look at his impressive resume? want to hire him? please? I don't want to breastfeed until this baby is four. We need groceries!). Anyway, we've just been hanging out at home having our own private Baby Music Classes in the living room. So far, the boy is really into 90s rock, which I find really weird. He also likes three-quarter time, thank goodness, and dirges (emo). Thought I could squeeze in a blog today during his regular 25-minute nap. But he's whining. Anyone out there an aspiring nanny? I have an awesome internship available for you. This whole Richard III thing has me thinking. I first read about the discovery of his bones back in September, when I was still living in the UK, and I thought it was one of the coolest things I'd hear in ages. The skeleton was found underneath a parking lot (way to act on a hunch, archaelogists!) and had head wounds matching the story that the King was killed with an axe or sword, and the skeleton's spine was curved in the same manner that King Richard III's was said to have been. I think that's the key -- how he was said to have been. Lore. Legend. Story. The recent news that DNA evidence actually proves that it is the King's bones is, of course, an amazing piece of history. But it also takes a lot of the fun out of the find. I think, today anyway, that I prefer that legends and stories be the test. I'm not a religious woman, so this tangent may be completely off base. But what if scientists announced that they had DNA evidence that there is a God. Wouldn't that kind of be disappointing? Did I just insult all of you? I bet Richard III wouldn't have minded a slight comparison to God. Anyway, I supposed you could say I don't have faith in religion, but I do have faith in stories. Also, it's fun to say Plantagenet. Plantagenet. Plantagenet. Plantagenet. Yoga at a Microphone in a Crowded room. For you, it might be your nightmare. Spotlight. Microphone. An instrument you haven't touched in 18 months. All eyes on you, the very first thing the audience sees and hears of a big, important radio show. But ah, audience, how I have missed you. Just singing just one song to a 619-seat sold-out theater made me exhale like I haven't in many a moon. Sure, I know most of them weren't there for me. They were there for an NPR show. But I had forgotten how relaxed and at ease being center stage makes me feel. I had forgotten what it's like to connect to an audience -- to make them smile, laugh, and applaud. To sing loudly and to play a gorgeous Emmylou Gibson guitar that had been exiled to storage (climate controlled, of course) for well over a year. It's like yoga, times a thousand. Now, if someone could just please book me a bunch of shows just as fab as Friday's. Lights, stages, audiences that show up on time, sound engineers. Ahhhhh. Somehow amateurs have "managers," so why haven't I ever had one? I'm on the upswing, friends! We've got an early riser in our home, and it's not me or David. Maybe the wee boy hasn't yet realized he no longer lives on GMT. Anyway, getting up early has NEVER been my thing, so I've been trying to make the best of it. 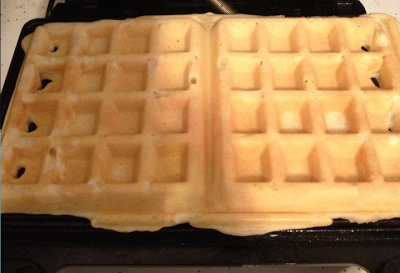 This week I invented: Waffles Monday™. There still isn't much food in our house, but I make a point to always keep the ingredients to chocolate cookies and pancakes on hand at all time. Then I realized I also have a waffle maker, so the party was ON!